Households forced to pay for the multibillion-dollar rollout of smart meters may never see their promised benefits, according to a scathing report by Victoria’s Auditor-General. The report lashes the Department of Economic Development, Jobs, Transport & Resources for failing to track properly the multibillion-dollar costs associated with the program, preferring instead to crow about its benefits out of context. It says the largest benefit in the estimated life of the program — $1.4 billion out of $3.2 billion — could be attributed to avoiding costs such as installing and manually checking older meters. These are savings that flow primarily to electricity distributors, rather than consumers, who have instead seen bills climb higher and higher. “When the rollout was announced, the benefits were promoted widely. However, when the government reviewed the program in 2011 it was clear there would be no overall benefit to consumers, but instead a likely cost of $319 million,” the Auditor-General’s report said. The report says costs are likely to go beyond that figure, and that, even in ideal conditions, consumers will only receive about 80 per cent of the benefits that have been identified. “The reality of the smart meter rollout is that the state approved a program, many of the costs of which it could not directly control, nor drive many of the benefits ascribed to it,” the report says. “Nevertheless, the rollout is now complete and Victoria has infrastructure in place that might lead to future innovation and benefits to consumers. Government’s role must now be to help consumers to get the most out of what they have paid for,” it said. Anti-smart meter campaigner Sonja Rutherford, of Broadmeadows, is one of thousands around the state who has refused the smart meter upgrade. She says her meter has been running for 45 years without incident. “The so-called benefits the government keep repeating — none of that has come to fruition that I know of,” Ms Rutherford said. She said smart meters, coupled with internet-connected appliances, would allow companies to cut off power to particular appliances at their whim. Up to 75,000 people kept “locked box” meters, refusing the upgrade, she said. A meter reader still comes to her house. “I don’t know what the advantage is except that they can rake in money for the cost of the rollout,” she said. This entry was posted in Smart Meter and tagged Smart meters, Victoria, Victorian Auditor General. Bookmark the permalink. The same message certainly is ringing out out right round the world. To this we all say HERE HERE ! The same message is ringing out right round the world. Smart meters are not smart at all, nobody wants them, there are no benefits ONLY harmfulness in every conceivable way. ‘Benefits of the smart meter rollout are to be passed on to the consumer’. How can the ‘benefits’ be passed on if neither the government nor the distributors know what they are measuring, let alone how to measure them (‘clause 4.4.1 page 47’)? We are almost six years into the program and they still have not worked out what or how they are measuring, so how much longer will it be before ‘cheaper electricity bills start appearing’? It seem to me that the original ESTIMATE, was based on too many ASSUMTIONS and ESTIMATIONS rather than KNOWN facts and ACURATE figures, thus producing a ‘flawed’ costing, a fact clearly stated in the 2009 Auditor Generals report. Even IF the figures presented were accurate, (clearly not the case) then someone has made about $1.5 BILLION profit so far, where has that profit gone? How could the people responsible for presenting the figures for the cost of this program, POSSIBLY get their figures so wrong? Who In government, accepted these wildly inaccurate figures without checking them? In my opinion, the authors of the original case for the rollout and the government person who accepted these figures without checking them; should be held responsible for the fiasco that has resulted from their incompetence, instead of the people of Victoria having to pay a heavy price for their mistakes. that I require for legal purposes. However, no individual has put their name (or signature) to the letter. Can anyone tell me what are the implications of this ? Surely an organisation cannot make statements without any persons being accountable for those statements. It seems like very cowardly behaviour to me. And who do I sue if legal action ensues ? I am determined to pursue my rights but it seems I am dealing with an entity that doesn’t have any people working for it. It seems that these days with retailers and distributors alike, no individual is game to put their name on any written document. What can be done about this ??? I would take aim at the CEO of the company, they are responsible for the actions of their employees. I have noticed that many of the replies I receive these days come from ‘the department of…..’ no name. or signature, as far as I am concerned, unsigned information is not worth the paper it is written on. I believe this is done because an un-signed letter is presenting false information and difficult to track down the author. Your right Peter you need a signature. Its know different to when we sign a piece a document.Also you are correct the CEO is responsible. AGL is a retailer not the distributor.They are cowards that is why many don’t give their surname.Hold the CEO responsible, you should be able to get contact details from the internet. Send your letter or notice in, via registered mail with a return receipt and give them 28 days to respond. If they have made any claims ask them to verify these claims and provide factual evidence to support these claims.Ask the CEO if he has first hand knowledge. If you make any claims have your evidence ready as well. They usually try to phone you, it would be good to record the conversation, usu don’t have to tell them. if they have threatened you or tried to coerce you into doing something you don’t have to do or want to do, tell them. Look up the penalties in the Crimes Act. Are they bullying you? Are they harassing you? Turn the tables on them. Go after the CEO and hold him or her responsible. The problem in Victoria is not only that the costs were past on to us without our approval, but also the methods used to get these devices on private property.The fact that this radiation is a possible carcinogen makes it worse. The possible cancer causing roll out should of been shelved long ago.What makes it worse is you have documents going back nearly 40 years that shows this radiation is harmful. How dare that report try to blame us? Never forget what they did to the people. Turned off a single mother’s power. Harassed us threatened us.Tried to expose us to toxic radiation.Blamed us, took our hard earned money. The propaganda machine has been overdrive lately.They should all be held responsible.Perhaps they think if they give people a choice of the meter they want, then all will be forgiven and forgotten. I don’t think so. No one forgets atrocities ever. How strange that the Auditor General resigned. On Tuesday, Mr Doyle tendered his resignation. Is it coincidence that his report was just released? Is it coincidence that Dr Karl was interviewed? Is it coincidence that that the Human Rights Commissioner is now looking into EHS? All these coincidences. I wonder who will resign next? Who would be the biggest liability in the Smart Device rollout? I can think of a few names. We need to see not just the resignation but resignation followed by trial and incarceration of a great many culprits of this crime of all crimes. They need a Royal Commission in Victoria. They resign and hope that this will be the end of the matter, but if they had an inquiry they would be required to answer questions. I think it is obvious that he was not writing the kind of report the government wanted to hear! I get the distinct impression he was only given the same misleading information we are given; because he doesn’t mention the 60,000+ disconnections because customers can no longer afford their electricity bills. Are the distributors allowed to claim the loss of revenue of these customers thus making it even more expensive for the remainder? If so, it will become a self destruct spiral. This man put his name on the report he is responsible for what it contains.If he thought the information was misleading he should of had it verified before the report was typed up. Why would he mention disconnections? The report basically blames us for the increase in costs.If he did not verify the information this is highly unprofessional. Peter if someone gave you information that can cause harm to others, would you not verify it before putting your name on the document? He pointed out that its not fair for other consumers to subsidize us. I subsidize people with solar panels and air-conditioners, but this seems to be fair. His report, his name, his signature makes him responsible. After his second scathing report criticizing the governments management of the AMI fiasco and informing the people of Victoria how they are being ripped off, it looks to me as though the Auditor General has been forced to resign ‘due to a complaint by one of his female staff members’. It would seem that the public will not be told what the complaint was, or whether it was investigated. It looks to me as though he has been ‘hung drawn and quartered’ behind closed doors. I find that unusual, as they usually let the media have a field day with officials who misbehave, eg, miss-use of cab charge, miss-use of funds for personal use, helicopter rides etc. If an Official has abused their position, then the public has a right to know why that person has simply resigned ‘under a cloud’. How many of these people have resigned? The Chief Health Officer, The EWOV Ombudsman. Many more to come hopefully. unfortunately, I can’t see that happening, for the simple reason they are supporting ‘government policy’! I can see this happening Peter, because when you become a liability its best to resign.The people are the Government, the other one is a corporation. They can support the policies all they want they still need to adhere to the laws of this country. No one is above the law Peter and especially corporate thugs. In my opinion, one of the biggest voices as far as misinformation on this subject; was minister O’Brien, while he was responsible for the rollout, making very public statements such as, ‘smart meters are compulsory’, ‘you cannot refuse to have one’, if you refuse to have a smart meter you will be disconnected from the grid’ etc, A complaint was made against him (not by me) via the ‘whistle blower’ legislation, but was dismissed as ‘he was doing his job supporting government policy’! it seems that he was moved out of that position into finance or something, his department was renamed a couple of times and when I wrote and asked him which laws said what he was saying, he simply quoted legislation quoting ‘ownership’ and ‘access’, I replied saying that none of the legislation he quoted backed his wording, that was about 2yrs ago and I’ve heard nothing from him since! If no one is above the law how are these departments getting away with what they are doing (or not doing)? Is it the laws that are wrong? I think this poses some very interesting questions. They get away with it because we don’t know how to deal with these problems. They don’t have to answer questions. The complaint might of not come under the whistle blower legislation. Other things do exist which you can use, but you have to find them and know how to use them. For example the Crimes Act.You can send notices.You can send an affidavit. If he said you can be disconnected from the grid, this is a threat and again no one is above the law. You can’t threaten or bully people its unlawful. Its not easy Peter to find these things out or how to use them. It takes time and patience but if we all start looking then we will find the solutions. I have a letter from this man’s office the letter contained no threat and only referred to Section 93 of the code. Even then the lady that sent it did not specifically say that this Section allows smart meter installers on your property. I am sure Peter you have been in this world long enough to see numerous injustices. I was naive myself two years ago, now i am learning how to play this game. And at least the person that made the compliant tried and that takes courage. Look up the Crimes Act Peter and find anything you can use, that is what i have done. I have been researching this subject since early 2010 on and off, I think that I have asked the right questions in the right department when I don’t get a reply! One thing I have learned is that you need to word your submission very carefully, in order to not give them the opportunity to avoid giving an honest answer. I believe, by doing this, they either have to admit fault, or refuse to answer, ‘on the ground they may incriminate themselves’? Another barrier to getting satisfactory action, is that any complaints against government officials; first go before a GOVERNMENT COMMITEE, who decide whether any wrong doing has occurred! (like asking Al Capone’s mum if she thought her son was a criminal) We have seen the farcical situation this causes, with one minister holding the ‘balance of power’ being cleared of any wrong doing, while another has been publically disgraced and booted out of parliament! THIS IS DEMOCRACY? Reading many of the submissions on this site, there have been many blatant cases of bullying, intimidation and threats, by not only distributors, but the government also, yet all these cases have been ignored. An example of this ‘misinformation is seen clearly on this ESC page. I sent an email pointing out that ‘smart meters are not compulsory’, also stating the reasons I believe their statement was misleading to say the least, again, as there has been no response what-so-ever, it seems to me I may well be correct?! So from that site we read…. Yes. The Victorian government put in place legislation requiring Victorias five electricity distributors CitiPower, Powercor, Jemena, United Energy Distribution and AusNet Services to replace the basic meter in every home and small business with a smart meter. What this doesn’t disclose to Victorians is that this “requirement” was to be by “Best Endeavours”. What does that mean ? It means it is law for the distributor to use their best endeavours. It doesn’t obligate the consumer at all. They have propogated a great lie to Victorians, and Distributors went over and beyond the use of “Best Endeavours” resorting to the unlawful actions of all manner of thuggery which they were given license to use albeit unwritten but by government. You should also keep in mind that the electricity meter at your premise is the property of the distributor. As such, they are allowed to replace their equipment, including the meter, and you are obliged to provide reasonable access to your property for this to occur. To this I say “BULLSH*T”. This is the crap they use to get into people’s minds to make them think they have to accept and allow this harmful and unwanted carcinogenic money generating apparatus to be installed. What manner of audacity is this to treat the people of Victoria as ignorant fools. They are allowed to replace their equipment….perhaps, but they don’t say that they are allowed to replace their equipment with anything known as a smart meter, an AMI meter or any other of a multitude of names that has since been used as a name for what is essentially a complete piece of sh*t apparatus that has literally destroyed many lives. This is the greatest swindle ever of the Victorian people, call it the great smart meter swindle of Victoria. Its not just a swindle it could be the biggest crime of the century. Peter, its not only the distributors that have bullied people and this is from personal experience. I have asked questions and they either send a link or they ignore the letter or they just don’t answer the question. Or they give out false and misleading information and when you question it, they ignore you. I can’t prove they read my email..
You have to give them 28 days to respond with factual evidence. Smart meters are not compulsory for us, it’s the distributors that were given the orders. This explains the tactics used. If we were breaking any law we would of been arrested by now. So they make up a lie about others subsidizing us, to increase costs and also to try and force us to do what they want. When the truth is that no one is subsidizing us, we pay for the meter reading service. They only come out every three months, its not a big deal. I think these “very small number” of Victorians are actually the well informed ones. The Auditor General’s Report itself puts that very small number at 38,595 (Figure 2A), hardly a small number, though I think the real figure could be something more like 75,000. I think claiming that we have a negative perception of smart devices due to misinformation and a lack of understanding is offensive behaviour and a i myself consider this rubbish just another form of psychological bullying. If the figure is only 38,595 how then can the hundreds of thousands of homes be subsidizing such a small number? Also some businesses still have analogue meters, are they being subsidized? If these businesses are being subsidized is this not also discrimination. The report needs to be corrected.If any lies were told then we need to make sure these are corrected. The article above states “Up to 75,000 people kept “locked box” meters, refusing the upgrade, she said” The Distributors have argued that smart meters are an upgrade.They are not an upgrade.I haven’t refused the upgrade because its not an upgrade and i have not refused, i have not given consent. Fitting a microwave radio transmitter to somebody’s house is certainly not an upgrade of an electricity meter. Are they adding components to the analogue meter or replacing components? Also you can’t refuse something that you were under no obligation to have in the first place.If you go to a cafe and don’t want a cake with your coffee, does that mean that you have refused? You are under no obligation to buy the cake so therefore have not refused, but declined the offer. We objected to the offer of a smart meter. It is not an upgrade or augmentation. 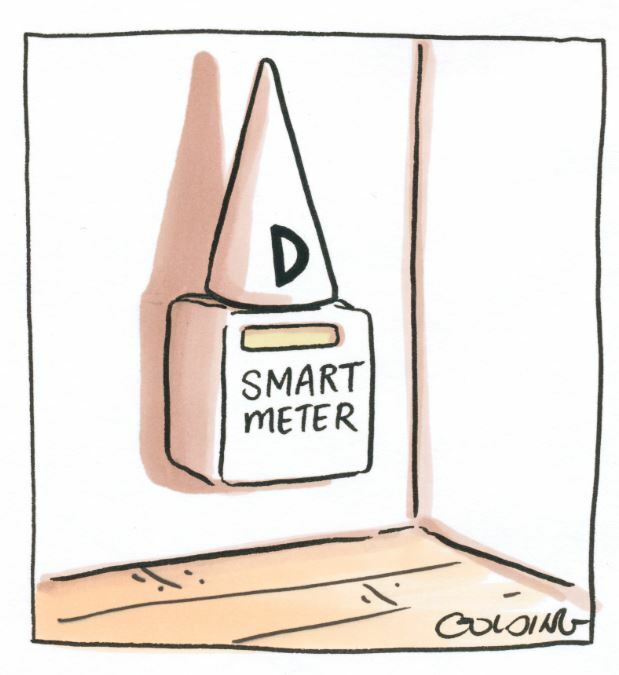 I heard Tom Elliott on his 3AW show lamenting that his smart meter was a piece of junk as his bills had gone up. An admin from stop smart meters, please contact him as it would be great to get a media person on our side. If you live in NSW, it seems you have been able to say ‘NO’ from the start!!!!!! In Victoria, the Essential Services Commission Incorporated are directly responsible for the ‘mandating’ of ‘smart meters’ and only supported by the Government of Victoria Incorporated, see under the heading, “smart meter’ in this document. Does this report have something to do with the Human Rights Commissioner being asked about EHS? Are they now trying to find a way out of the mess they caused, because people are sick? The Auditor General should provide factual evidence to support any and all claims. Is the Auditor General a psychiatrist? How would he know that i have a negative perception? Can he produce the evidence to show that we have been given misinformation? Can he produce the health reports? This report needs to be rewritten. Unless the Auditor General can produce factual evidence to support his claims and first hand knowledge. I think they will now have to start removing these devices as many of us have written to the Human Rights Commissioner. They are aware that people are sick and many more will become sick. The report aims to justify everything they did.This includes the manual meter fee.It is fact that people that don’t have air conditioners subsidize those that have.How is this fair? Is this not discrimination? So its not fair for people with smart meters to subsidize those with lawful analogue meters,but its fair for people to subsidize homes with air conditioners. How exactly are those with smart meters subsidizing us? We pay for everything. Perhaps the Auditor General can explain how much the subsidy is? How much are people with smart meters paying to allegedly subsidize those with lawful analogue meters? He must have this information. Everything in that report that we don’t agree with needs to be brought to the Auditor General’s attention and he will now need to gather his factual evidence to support his claims. hey good news. do yourself a favor and goodle the code yourself..but read all of section 6 of the “electricty customer metering code”..just google it. really we customers should have been made aware of this optioning. we have a situation where we installed solar panels under the understanding that our analogue meter was going to be satisfactory. becaue it runs backwards so much, our energy company won’t recognise the reading as legit. so we have gone to the ombudsman EWOV and are waiting to hear back from them with some trepidation of the outcome. this code gives us some hope. I did read that there are analogue meters out there that were fixed so the could never run backwards when solar was fitted. obviously ours is not one. is there anyone out there who can confirm this is factual that there are analogue meters locked so they don’t run backwards? we don’t want a smart meter as family members are over sensitive to them! Robin, are you prepared to lock your meter box and to never open it again other than for meter reading purposes ? Because if you do that, you will never have a smart meter. Are you prepared to do that regardless of what utterances may be voiced your way by whomever ? In other words, come what may. It is time for the Victorian State Government to cut its losses now because if it doesn’t, I can guarantee you that it stands to lose a hell of a lot more than what it already has. The best way to get the most of what’s been paid for is to now just SCRAP IT once and for all. There is talk about all these great “benefits” that smart meters provide except we don’t actually know what these “benefits” are, we certainly haven’t seen them and the price we pay for these benefits is to have pulses of carcinogenic radiation transmitted through our house every few seconds. This must be one of the greatest criminal acts of all time. Demand the right to have our Safe and Passive and human non sickness making Analog Electric Meters returned to us which I am told have been boxed up in the five Victorian Electric Power Companies warehouses. Both the five Victorian Electric Power Companies in collusion with the Victorian Governments of both Labor Party and the Liberal Party have unlawfully tricked and evilly harassed the people of Victoria into giving up the Safe and Passive Analog Meters they’d had and or Stole these Safe and Passive Analog Electric Meters when the people of Victoria were out shopping or away from home or on other errands. The behaviour of these five Electric Power Company Smart Meter Installer men was a disgrace and amounts to THEFT and collusion by the Victorian Government and the five Electric Power Companies of Powercor, and Citypower and Jemena and AusNet Services and United Energy. The only Lawful and decent remedy is the removal of every Electric so-called and far from Smart Meter, and the immediate reinstalment of the Safe and Passive Electric Analog Meters. Anything less than this is UNLAWFUL. This must be done free of any monetary charge to the people of Victoria and done immediately. So can we please have our old analog meters back now then? Thankyou for that insight Steve. The auditor general’s report has some questionable claims which should be investigated. Firstly the auditor general has stated “There still exists a very small number of Victorians less than one in 10 who have a negative perception of smart meters due to misinformation and a lack of understanding.” Would the Auditor General care to provide more specific details of the type of information he believes is being used to mislead people? What about acknowledgement of the campaign of misinformation that has been heaped on the public by the Power Utilities and Government regarding the number of transmissions per day and the so called benefits that have not yet materialized? Then there is this problematic statement “The delay in completing the smart meter rollout was also impacted by the active refusal of customers, based on concerns relating to health or for other reasons….. It commissioned several reports, including a study into the health impacts of electromagnetic emissions from smart meters, and found that their emissions are well below the established exposure limits.” The auditor general, like the politicians, has fallen into the trap of believing that because the wireless emissions from smart meters are well below Australia’s RF Standard it must therefore be safe. The RF “cooking” Standard is not fit for purpose. Of course there is so called technical study sponsored by the Government that was supposed prove they are safe but did not investigate the many hundreds of Victorians whose health has been impacted. This technology has never been formally tested for human health outcomes and so to claim they are safe is a spurious and irresponsible statement. The Government continues to ignore those who claim they were impacted and refuses to investigate – perhaps they are afraid of what they might find? Unfortunately duty of care has gone out the window in favour of the Power Utilities so that they can increase their profits at our expense. If you ask these people what they mean when they say that smart meters are “safe”, they have no idea what they themselves are saying because they cannot even put a definition to the word “safe”. Their claims are spurious claims indeed. I am disappointed it does not state people should be entitled to have the choice of having their old analogue meters reinstalled if they request it. Hi Boopsy, hang in there until 2017 when ‘competitive metering’ is to be introduced. It seems only then will you be given the choice of what meter you have. The question is, will be there be any none ‘smart meter’ types available? Obviously, the distributor/government will argue over the interpretation of this code, but I believe my interpretation is valid and until someone argues the point, the distributors/government do not have to worry about the customer challenging them! Hi Peter is that clause already in the Code? or are you saying it will be added in 2017? its the first time ive heard about it! The clauses I have quoted are already in place and have been for a couple of years. The reference to ‘competitive metering’ is in the latest Victorian Auditor Generals report, which once again slams the AMI costs/benefit theory. This document is well worth the read and to me shows the incompetence of the Victorian government and it’s departments in it’s decision to implement the rollout and the further decision to continue made in 2011. It seems that the responsibility for metering will be removed from the distributors and become a separate business competitive entity.